The City’s Main Streets initiative is analyzing the growth needs of Calgary’s 24 main streets. City planners will create solutions which encourage development in these areas by considering feedback from main street users and economic research. Thank you to those who provided input. Phase 3 is now complete. Please visit the Main Streets initiative project webpage or look at the reports below to see what we heard. Main streets are active areas that attract Calgarians to socialize, work, shop, dine, and celebrate local events. They are also often important transportation routes. According to the Municipal Development Plan, there are currently 24 main streets across Calgary. Main streets are important to the long-term growth of our city, and are ideal places for mixed-use development, including residential, commercial and retail development. Access to transportation options, infrastructure and amenities make these areas great places to live, work or visit. The City’s Main Streets initiative is analyzing the needs of neighbourhood residents, along with economic and market research, to identify success criteria for future growth in these areas and to develop strategic planning direction and implementation. 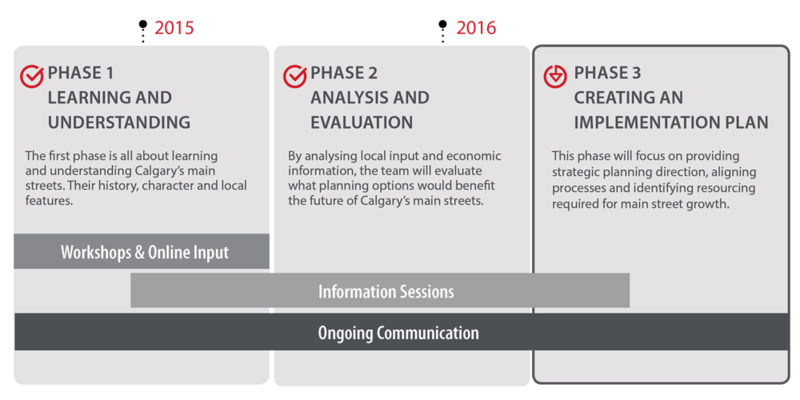 The City’s Main Streets’ team has been working on solutions for the future growth of Calgary’s main streets by considering local input, market analysis and current conditions. Based on reviewing this information, many of the main streets are ready for development in the near future. City planners are looking at what solutions would work in these areas to enable growth and change. The first two phases of the Main Streets Initiative provided the information to prioritize which of the main streets would require engagement in phase 3. Two main streets were prioritized for phase 3 that are not part of this engagement: 9th Ave SE and Centre Street as they are part of the Green Line engagement process and additional engagement is not required. Below are the reports of the feed back we heard from everyone who participated online and in-person for each Main Street in phase 3.
factors when planning future large redevelopment sites. Based on all of the information gathered, a series of proposed solutions were created which would enable growth and development in these areas. At these sessions you there was review and discussion of the planning concepts which have been informed by the previous public input sessions. Stop by and review the tools and techniques that will be used to prepare Calgary’s main street areas for change. The final planning concepts will be presented to City Council’s Planning and Urban Design Committee in late 2016/early 2017. For more information please visit the Main Streets initiative project website. The first phase is all about learning and understanding. We need to learn about all of Calgary's main streets - their history, character and the local market from residents, businesses, industry representatives and experts. By analysing local input and economic information, the Main Streets team will start evaluating what policy; land use or other planning options would benefit Calgary's main streets. This phase will focus on providing strategic planning direction, aligning processes and identifying resourcing required for growth opportunities in main street neighbourhoods. Subscribe to receive updates and invites to future events.